The familiar, stylish lines of the Samsung E720 conceal a phone that is redically different in almost every respect from earlier E700 series handsets. The camera on the Samsung E720 is a megapixel class device, and the internal display has been upgraded to an impressive 176x220 pixels in 262,000 colours. The E720 has Bluetooth for flexible connectivity, and around 90Mb of internal memory, which is great for storing photos, MP3s or video clips - and the SGH-E720 has a set of media control buttons on the outside too so you can control multimedia clips without opening the case. There's a WAP 2.0 browser, email client, video capture and playback capabilities, multimedia messaging and of course the Samsung E720 supports Java for games and other applications and has polyphonic ringtones. 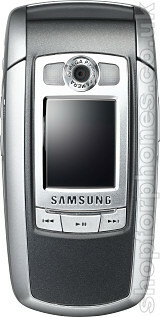 The Samsung E720 is a tri-band GSM phone with GPRS data, and it weighs around 90 grams with a physical size of 90x45x23mm. Battery life is to be confirmed. Exact details of this handset are awaiting confirmation from the manufacturer. Please subscribe to our newsletter for updates. If you want more information on the Samsung E720, subscribe to our mailing list. Also, the Update newsletter contains general news about new phone releases.